The 1940 Census and Hamlin Street. 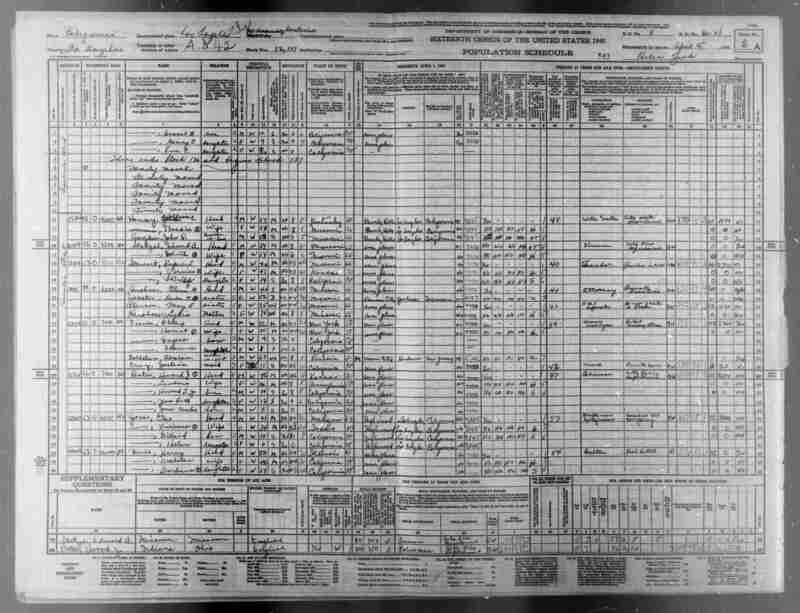 The US Census Bureau has digitized and uploaded the 1940 US Census, a fascinating and information filled overview of that nation of 132 million in limbo between the hard times of the Great Depression and about to dive into the bloodbath of World War II. California, which today has close to 40 million people, only had 6.9 million. Van Nuys, established 1911, was a town surrounded by agriculture and dotted with orange and walnut groves. I was eager to see who lived on my street (Hamlin),who they were and what they did for a living. 14950 was the most expensive property on the street, with an estimated value of $10,000. Harry Bevis, a 50-year-old realtor, lived there with his 42-year-old wife Arabelea and 17-year-old daughter Barbara. 15010, worth $7,000, was owned by 42-year-old City Police Superintendent Howard J. Bates. He lived with his wife Lavenia, 36, son Howard, Jr.,14; daughter Jean Ruth,13 and James Charles,5. Native Missourian Glenn M. Hirschner, attorney, age 40, occupied a $6,000 home at 15050 Hamlin and lived with his 75-year-old mother Lydia, and two sisters, Bebe, 52 and May, 35. I wonder what they all did for fun? Edward A. Stazel and his wife Edith, 57 and 58 years old respectively, lived at 15134, a $5,200 home. Mr. Statzel was a fireman. At 15032, Phillip Fianes, Retail Grocery Store Manager, age 32, lived with his 35-year-old wife Harriet, her 67-year-old father, Abraham Goldstein, and two children, Eugene,4 and Florence, 1, in a $7,000 home, along with a maid, 18-year-old Justine Cruz. He reported a yearly salary of $2,760 or $51 a week. And he still could afford a maid. At 15000 Hamlin, we find the highest earner on the block at $3,500 a year. He was 41-year-old petroleum draftsman/ engineer, Cleo Jones who supported his 34-year-old wife Vivienne, son Dillard, 14, and Helen, 6. $2,700 a year teacher Rupert L. Stewart, 49, lived at 15104 Hamlin with his 43-year old wife, Vernice and 14-year-old Shirley in an $8500 home. Who names their daughter Shirley any more? Money was tight then and money is tight today. Well done–the story of Van Nuys and the Valley is out there–and you can find it in such sources. How much we have lost in story-telling–the actors who lived in the “Hollywood ranchos”, Spanish inspired homes throughout the area north of Sherman Way west of Van Nuys Bl. At CSUN you can read the l941 VAN NUYS GREEN SHEET, precursor to the DAILY NEWS, and see it all. for the “before and after”–as for the war– because some one living in Van Nuys would have remembered the Christmas parade down Van Nuys Bl on Saturday, December 6th, and a dance held by blocking off Sylvan Street, west of Van Nuys Bl, in front of the old Van Nuys post office and library. Go to that spot now–you can’t even imagine a large dance held in the street–right there. Thank you Jon. Appreciate your comment.